If you're tired of the rash of high definition, modern-day lawn mower video games that have been flooding the market in recent years, get ready for a grass trimming simulation that takes you 60 years into the past. It's the Nintendo Download, people! 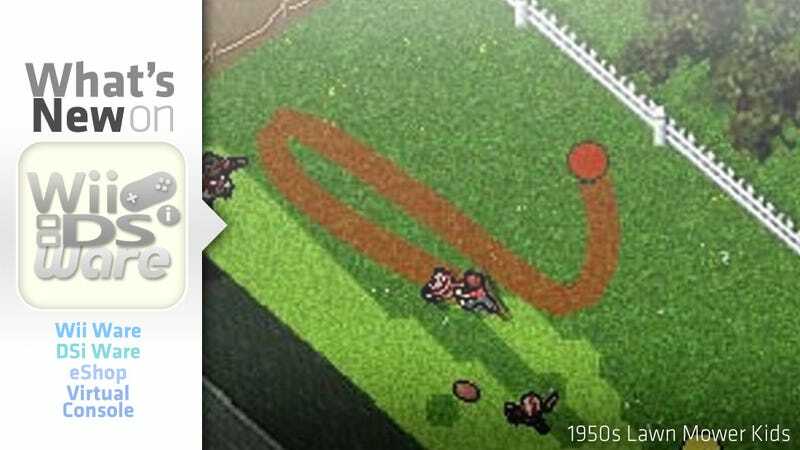 Maybe you didn't know you needed a DSiWare game that combines the timeless art of lawn mowing with a classic American setting. Perhaps you didn't realize how much you truly wanted to avoid angry pets and someone named Grump Old Joe as he chased your child avatar around the yard in an era where he wouldn't get arrested for doing so. It's okay. I didn't know I wanted 1950s Lawn Mower Kids either. There was an inexplicable emptiness, and then this. Feel free to browse through the rest of this week's offerings; I know your heart is already set. Your mission is to mow lawns while avoiding dogs, ducks, cats and people like grumpy old Joe in a beautiful suburban 1950s American setting. Control time and speed with Mr. Mowman's mysterious contraptions. Lead the kids Tom, Nancy and Tim out of danger. Avoid mowing down intricate flowerbeds, crashing into well laid tables and angry animals. The key to success is keeping all three kids moving and to use the abilities of each kid to your advantage. Remember, ill tempered old Joe will keep an eye out for sloppy children that mow down his flowers! • Multitasking gameplay: Control 3 kids simultaneous. • Unique mowers, abilities and powerups for each kid. • Devious pets and old Joe who chases flower-mowing kids. • Increasing speed for skillful play. Join Dr. House and his diagnostic team and race against the clock to solve a new medical mystery. Dr. Gregory House and his elite diagnostic team race against the clock to unravel a new medical mystery. An aging reality- TV host seems to care less about his own health than his fame and reputation. Track down the correct diagnosis by interviewing and examining the patient, running lab tests, searching locations and even performing surgery. Take to the skies in a balloon to save your younger brother. In the little town of Pencilvania, there lived a brother and sister who loved to play with balloons. Alice and her younger brother Jim would spend countless days filling the skies with their balloons. One day, Jim filled all of his balloons and tied them together to make a beautiful balloon rainbow across the sky. But suddenly, a strong wind came and carried Jim away. As Alice, you must save your brother from peril. Float through eight different stages as you follow Jim's trail of balloons. Collect as many balloons as possible to earn bonuses. Test your piloting skills to avoid enemies, or let go of your balloons to face enemies on the ground. In "Balloon Trip" mode, compete for the highest score and move up the ranks. Take a big gulp of courage and give Alice a hand as she searches for her missing brother.